Is soy healthy or a hazard? Soy is often touted as a wonder food: a low-fat, high-protein meat alternative that lowers cholesterol and helps prevent certain kinds of cancer. But does soy have a downside? Some research suggests it may. 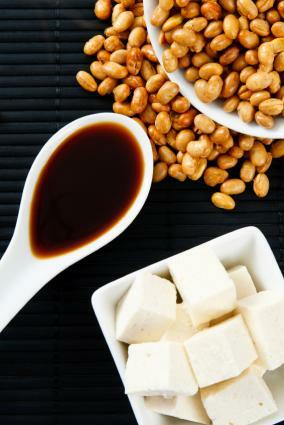 Deciding whether to make soy a part of your diet comes down to weighing the risks and benefits. Are the health benefits of soy fact or hype? Vegetarians and vegans sometimes struggle to get enough protein in their diets, and soy can be a perfect solution. Soybeans are high in protein and fiber and low in fat, and as such, they're used in many vegetarian- and vegan-friendly products, from tofu to soy burgers. Since protein is a crucial component of a healthy diet, the benefits of soy to vegetarians are clear. Soy may also help lower cholesterol. Clinical trials have repeatedly shown that patients who add soy to their diets can reduced their LDL, or "bad," cholesterol levels. The evidence has even convinced the Food and Drug Administration, which allows companies to advertise that their foods reduce the risk of coronary heart disease if their products contact at least 6.25 mg of soy per serving. Another potential benefit of soy is hormonal. Soy is rich in phytoestrogens, which are very similar in structure to human hormones. These phytoestrogens bind to estrogen receptors in the body, stimulating estrogen production. The process may help menopausal women find relieve from their symptoms. In fact, some believe soy may explain why women in Asia, where diets are heavy in soy, complain about menopausal symptoms much less than their Western counterparts. The Journal of Perinatal Education conducted a study that suggested soy may also prevent osteoporosis in menopausal women. Consuming soy may also protect against certain cancers. According to an article in Oncology Nutrition, one study showed that soy curbed the risk of endometrial cancer, while the University of Minnesota demonstrated soy's potential ability to help treat childhood leukemia. Soy's hormonal properties, which some consider to be the food's biggest benefit, may also be associated with its biggest risk. Increased estrogen in the bloodstream can trigger or worsen estrogen-based cancers, like certain types of breast cancer. According to Web MD, many oncologists recommend their patients stay away from soy products completely because they fear the soy will encourage breast cancer cells to grow more quickly. Soy may also be harmful to thyroid patients. Several endocrinology research groups, including the Weston Price Foundation, have suggested that soy may inhibit T4 and T3 (thyroid hormone) production, leading to hypothyroidism. According to Dr. Kaayla Daniels, author of The Whole Soy Story, consuming more than 30 mg of soy per day can impact thyroid function. Soy detractors also suggest that the benefits of consuming soy just aren't true. The American Heart Association, which once embraced soy as a treatment for high cholesterol and associated heart disease, has revised its position to state that soy does not offer any proven benefits for heart health or cholesterol levels. When weighing the pros and cons of soy, it's hard to ignore the health benefits Asians seem to be getting from their soy-based diets. Why do Westerners who add soy to their diets seem to still struggle with increased cancer rates and hypothyroidism? According to Dr. Daniels and other researchers, the problem may be consumption levels and growing processes. The typical Asian diet includes about 10 to 30 mg of isoflavones from soy per day, while Americans adding soy to their diet often consume around 80 to 100 mg per day. Furthermore, Asian diets tend to include soy in unprocessed forms, while soy on American food shelves has been processed and sometimes genetically modified. The jury is still out on the safety of soy, and the food may affect people differently depending on their general health. If you're thinking of adding a significant amount of soy to your diet, check with your doctor.